The hint of sweetness from the plantain and the coconut milk are a great combination that isn’t too sweet like a pina colada. One sip and it will transport you to the tropics no matter where you live! As with all of my margaritas, you are making them from scratch so choose a good quality tequila. I highly recommend one that contains 100% agave. See my recipe Simple Syrup if you would like to make your own simple syrup. The following recipe made 2 servings as shown below with a little more for topping off . Peel the plantain and add to the blender along with remaining ingredients. Blend until smooth. Place kosher salt onto a small flat dish. Smear one of the limes that was used to make the margarita around the rim of the margarita glass in order for the salt to stick to it. Salt the rim of the glass by dipping the rim into the salt and moving in a circular fashion until evenly coated. 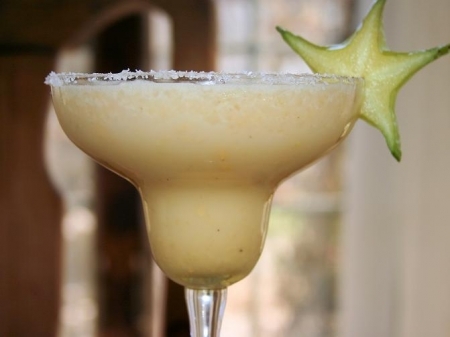 Pour margarita into glass and garnish with a slice of star fruit.